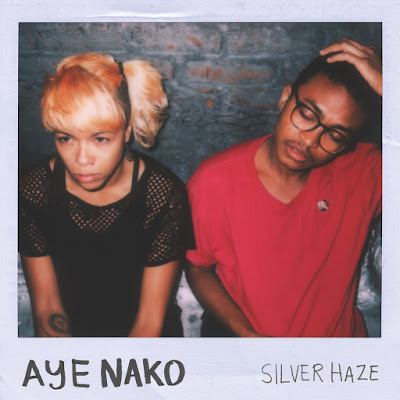 Aye Nako's latest album Silver Haze glitters with poignant songwriting. "The Gift of Hell" and "Particle Mace" expertly display Aye Nako's diverse range of sound and mood. "The Gift of Hell" pairs light vocal harmonies with a drone-y vocal melody, while unsettling guitar riffs squeal in the background. "Particle Mace," on the other hand, starts high before bottoming out to lows, much like "Sissy," but the tense parts of this song are in the form of dissonant string picking. "Particle Mace" swirls with imagery of a desolate desert wasteland with talk of “horseshoes,” “wind, ”and “freight trains,” matching the isolation they felt as they “rekindled solitude.” "Maybe She’s Bored With It" wraps up Silver Haze with the brightest riffs and light keys that twinkle in the background. Although, the message of "Maybe She's Bored With It" offers up something more heavy. In the song, Aye Nako tells the story of being lost in the monotony of a dead end job, consumed by disinterest and fed up with going through the motions. The name of the song is a witty play on Maybelline’s ad slogan, “Maybe she’s born with it,” and cleverly contrasts the exhaustion felt by the songwriter. We've all felt this frustration before, but Aye Nako reminds us that these times don't last forever. Listen to Aye Nako on bandcamp.